It is never too late to start thinking about the holidays and gifts. A cross stitch cuff makes a great gift for men, women and children. You can make several of these over time and keep them for birthday gifts or use a fundraiser gift. Think outside the stitchy box and make a beautiful accessory. This cuff is great for people who have metal jewelry allergies.You can use different types of floss or even leather strips! Stitch a Cross Stitch design on plastic canvas, add a button and a loop fastener and create a cross stitch bracelet. Create bracelets of varied widths and colors. Match outfits and make a personal fashion statement. You stitch a quote, date, favorite sports team, or just random patterns. You are only limited by your imagination. Begin by gathering supplies for the project. When choosing the design for the bracelet, a simple border pattern or repeated small motif will work best. Another option is to add your initials or a small back stitch saying to cross stitch background. The free Sideways Heart Border pattern was selected for this project. 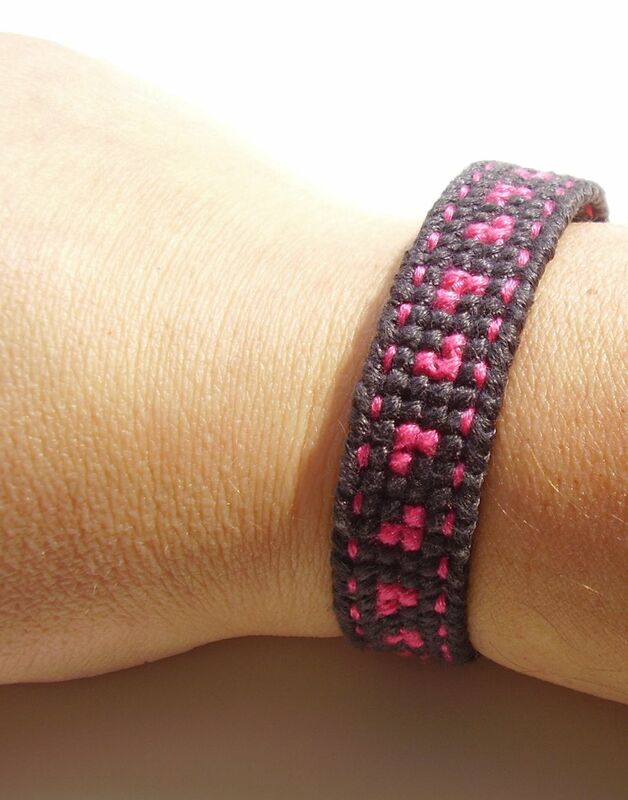 At six stitches tall, the bracelet is slightly over 1/2 inch wide. for a wider cuff bracelet, select a pattern with more stitch height. For other suitable patterns, see free border and alphabet patterns. After choosing the pattern, carefully cut the plastic canvas to the proper size. Check the pattern for the width of the bracelet. To determine the length, measure your wrist or wrap the piece of canvas around it. The canvas will need to overlap slightly (about 1/2 inch). If the bracelet for someone else and you are not certain of the measurement, don't panic. Adjust the button fastener as needed to ensure a proper fit. Trim the edges of the canvas and stitch the design. I used six strands of floss for cross stitch and three for back stitch. Be sure to separate the strands to ensure better coverage. Use the loop method to start the floss. When securing the floss, run a long tail under the back of the stitches to ensure that it will not become loose with wear. Depending on the design you have chosen and the length of your bracelet, more than one skein of floss may be needed per color. Finish the edge of the bracelet by whip-stitching the edge with six or more strands of floss. For my bracelet, I whipped the edge in one direction with six-strands. Because more plastic canvas was visible than desired, I added a second layer of whip-stitching in the opposite direction. When the stitching is complete, check your work to make sure all the floss ends are secured. Create a fastener for your bracelet. I used a button and a loop of floss. The placement of the button and loop are visible in this image of the Sideways Heart Border bracelet. Be very careful when cutting the plastic canvas. If you miscut the fabric, use super glue or hot glue to easily repair it.It is okay if you cut it wrong, but try not to waste the canvas. Secure a long tail of floss to ensure that the end does not work out as you wear the bracelet. Experiment with designs and color to create your own personal fashion statement. You can also make cuffs with names, quotes or favorite sports teams. What Is a Skein in Embroidery?